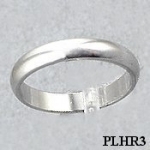 Stock #PLHR3:3mm wide Platinum Wedding Band. Standard half round band, matches #PL542795 Engagement ring... Very Nice, Top Quality, Ring!!! Available in 14k White Gold or 14k Yellow Gold.